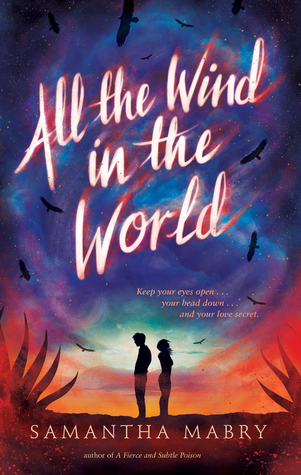 Hauntingly beautiful and dangerously enticing, Samantha Mabry’s All the Wind in the World is a fantastic addition to the romance genre in young adult literature. With the desire to eventually own their own land and live a life of peace, Sarah Jac and James are forced to find work in the harsh conditions of the maguey fields. But when a disaster strikes, the two must find a new place to work, where their strength and relationship will be put to the test. In this gripping tale of love and sorrow, Mabry’s novel promises to have readers intrigued until the very last sentence. Way back at the beginning of September, I was selected to receive an ARC of All the Wind in the World…it was SUPER exciting, since I had just recently started up a NetGalley account! Due to the lack of a Kobo, it took me FOREVER to start this book. Fortunately, my mom gave me a Kobo as an early Christmas gift and I was finally able to start reading this. Mabry’s young adult novel was a fairly enjoyable read, and a very quick one at that. Though there are some things that made me question the point of the story, my overall reading experience was pleasant! The general idea of the story stems from a couple trying to make a living by working on maguey fields, in the hopes that one day they’ll be able to afford a home of their own one day. Due to the high competition on finding jobs in the fields, Sarah Jac and James pretend to be cousins rather than a couple…since couples are easier to target. Obviously, we get some tension regarding jealously and lovers quarrels. When it comes to genre bending, this book definitely hits a home run. Mabry adds romance, magical realism, contemporary, and dystopia all into a book that isn’t even 300 pages…that, my friends, is a pretty incredible feat. It’s nice since it opens the book up to multiple readers rather than gearing towards one genre. Nevertheless, there are a few things that didn’t sit well with me. One is the world itself; readers know that it’s our world since it references cities we know, yet Mabry never really discusses the state of the world fully and how it got to such a state. For those who are very detailed oriented when it comes to setting, you’ll be a little disappointed. Most of the characters are fairly likeable, even the ones you aren’t supposed to like; personally, I find this a BIG plus since I find it incredibly difficult to read books where I can’t stand the characters. Funny enough, James is the ONE character that really bothered me. Most people seemed to get fed up with Sarah Jac, but she’s probably one of my favourites. James confused me…a lot. I didn’t understand his reasons for making certain decisions and how he ended up from one point to the next. With the story being a first person narrative under Sarah Jac’s POV, this could be a major reason why this happened. The language throughout the story is beautiful and captivating. Even though the plot confused me and the characters drove me nutty at points, I never felt quarrels or disappointment with the writing. The amount of meaningful and beautiful quotes in this story is simply astounding; even though I didn’t really understand what was happening, I could at least find meanings and lessons in various passages throughout the tale. I feel incredibly bad, since I feel as though this review fell a little short. Honestly, I had a REALLY hard time reviewing this book; either I felt unsure how to convey my thoughts or I didn’t have thoughts due to utter confusion of this book. It was both a beautiful read yet a disappointment. When reading the synopsis, I was expecting more action and danger; unfortunately, the story focused largely on confusing events and the awkward romance rather than any sort of grand voyage. A lot of the choices and actions made by characters didn’t make sense to me, yet I still felt this desire and urge to finish the story. If you’re looking for a romance and magical realism focused story, this may be a good choice for you! Welcome to the ranks of NetGalley readers. And congrats on the Kobo as a Christmas present. That’s great! Awe thanks! I just finished my fourth book out of five on NetGalley! Great job. I need to catch up on some of my NetGalley reading and reviewing. My review percentage has dropped to 70% and I’d really like it to be at least at 80%. Haha, glad to know I’m not the only one who sometimes struggles to keep that percentage up. Thank you! Honestly, I do think the Kindle is better and I see myself getting one eventually, but I already had so many on the Kobo and I was more familiar with it. One thing I find is that NetGalley downloads sometimes don’t like to work if it’s not the Kindle. Some of the text was missing for my latest download so I got the Kindle App on my phone and tried the Kindle download…which worked. So I’m working between both ha-ha! I just want all the book mediums!